It’s the only bus you would ever hope to be stuck behind during an exhaustive rush hour commute. 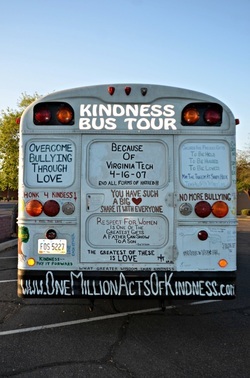 Its colors are so vibrant and its message so loud that you will probably swear you saw the “Kindness Bus” before hearing it! At first glance, you may even swear that behind the wheel of this happy, mini-school bus is a flower-child who never grew out of their bell bottoms and is touring the country preaching about peace and love. However, upon closer examination you will discover this bus is a powerful vehicle of inspiration changing lives one mile at a time. “Most of the time kindness isn’t a goal,” said Votruba. “But if you look at it as a goal you start thinking about.. I’m going to be kind all day long. That’s what One Million Acts of Kindness is; an individual lifetime goal for each person. It’s catching on in a very big way, which is so awesome.” You can read about Votruba's latest crusade on his T-Shirt, which reads "Riding 9,000 miles for kids. Put an end to Bullying and Adolescent Suicide." When Bob's not waving at people from inside the bus, he's giving high fives to kids on the streets as he cruises through cities on his bicycle stopping at schools to raise awareness among children and their parents. While you won't see a house address painted anywhere on the bus; this is where Votruba calls home. Yes, you read that correctly. The kind eyed, middle aged father of three sold his upper middle class house in Ohio and all of his personal belongings six years ago in preparation for his pilgrimage. So what possess a father of three with an extremely successful career to sell EVERYTHING to promote kindness? Votruba answers this question by pointing to the inscription on the back of his bus. "END ALL FORMS OF HATRED!" "That was the reason that was the tipping point for this," said Votruba. " I just wanted to make a difference. I just wanted to make the world a better place." Votruba's tour has included trips to Washington D.C. where he has addressed the National Institute of Mental Health and met with Lynn Rosenthal, White House Advisor on Violence Against Women. By the time The Greater Purpose Project is complete, The Kindness Bus will have made stops in all lower 48 states and many more than once. For more information visit www.OneMillionActsofKindness.com.